Find the information you need to plan Pas de la Casa ski vacation. Travelers to this region of the Pyrenees can find basic resort and ski area information as well as details about the surrounding mega ski area, Grandvalira. 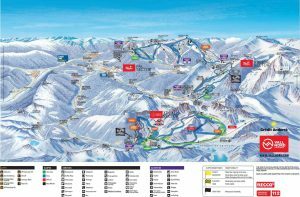 This includes hotels, instructors, transportation, lift passes, equipment rental, piste maps, and more. We are also looking to provide regular snow reports and weather forecasts for Pas de la Casa. 12 in the immediate area, 66 total serving 205km of piste. The resort sits at an altitude of 2050m with the highest lift at 2640m making Pas the highest resort in the Pyrenees. Pas de la Casa shows its true colors as a skiing town in the winter months, where it’s quite the social and recreation destination. The height and excellent snow making capability ensure good snow conditions and a long season ensure the perfect conditions for ski holidays in Pas de la Casa. Pas de la Casa is the highest and sunniest resort in Andorra, perched right on the French border within the Grandvalira ski area, the largest in the Pyrenees. Grandvalira now offers 193km of piste, forming the largest skiable domain in the Pyrenees, with a very modern and efficient lift system to transport skiers around the large variety of slopes it has to offer. 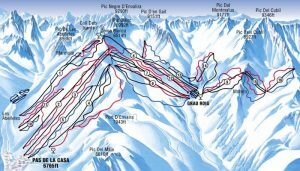 Pas de la Casa or Pas as it is commonly known, shares the Grandvalira lift pass with neighboring resorts. Pas, however, boasts an excellent snow record, a state of the art lift system, and an excellent selection of slopes. Ski holidays in Pas de la Casa offers something for all abilities, although intermediates and beginners are probably best catered for. Snowboarding is particularly popular and there is a board park and half pipe. Ski school as in neighboring ski resorts, is dominated by English speaking instructors, so ski holidays in Pas de la Casa are excellent for beginners. Bars and restaurants abound to suit all tastes and pockets. In 1956, the businessman and ski champion Francesc Viladomat installed the first ski lift on the peak of Coll Blanc in Pas de la Casa. Powered by a lorry engine, the lift could carry up to 450 skiers per hour. From then on, the resort grew at an average one new lift per year. The first automatic snow cannons were installed at Pas de la Casa-Grau Roig during the 1980s. The first 8-seater cable car in the Pyrenees began to operate in 1996, and a new sector, Canillo, opened. Meanwhile, the first six-seater detachable chairlift in the region entered into service at Pas de la Casa-Grau Roig, operated by SAETDE, in 1997. If you are an independent traveler, we can help you in your travels to Arinsal, Andorra. Get all the basic information you need to plan your trip including hotels, instructors, transportation, lift passes, equipment rental, piste maps, and more. We are also looking to provide regular snow reports and weather forecasts for Arinsal. 31 serving 63km of piste for Pal & Arinsal. Although many people have heard of Andorra and it’s tax-free shopping and ski resorts, few have actually ventured further than Andorra la Vella, the capital city, just beyond which lies the village of Arinsal , one of the most up and coming ski resorts in Europe which is now linked to the neighboring resorts of Pal and a short bus ride to Arcalis. It’s the friendliest place ever, has some excellent bars, cheap and luxury accommodation to suit all budgets and the fact that 40% of visitors return says it all. It’s a popular resort with the British and Irish, which guarantees you will have a good time on and off the slopes. The Arinsal sector has the largest vertical drop of just over 1000m (3,300ft) and stands in the shadow of Andorra’s highest mountain peak-‘Coma Pedrosa’ which is 2,842m (9,708ft). Winter is the best time of year. From beginners to the most advanced, the mountains are covered with snow and are just waiting for you to have a fabulous time.